Take a canoe trip along the River Thames with London Kayak Tours. London has over 100 miles of waterways, making canoe trips and kayak tours a great way to explore the city. Adventurous explorers should check out the specialist companies which provide kayak trips and touring on the River Thames and London’s extensive canal network. You don’t need any previous experience to try a kayak trip in London. Highly stable boats and experienced staff mean that even nervous beginners can brave the Thames, seeing London from an angle that few other people will. Tower Bridge is pretty cool, but it’s even cooler when you paddle underneath it! London Kayak Tours specialise in providing guided kayak trips on the Regents Canal and on the calmer, upstream stretches of the River Thames. Their Regents Canal trips visit London’s Camden Town and Regents Park Zoo. Out on the Thames, their canoe trips take you past Windsor Castle and Hampton Court Palace. Check out their website at London Kayak Tours. 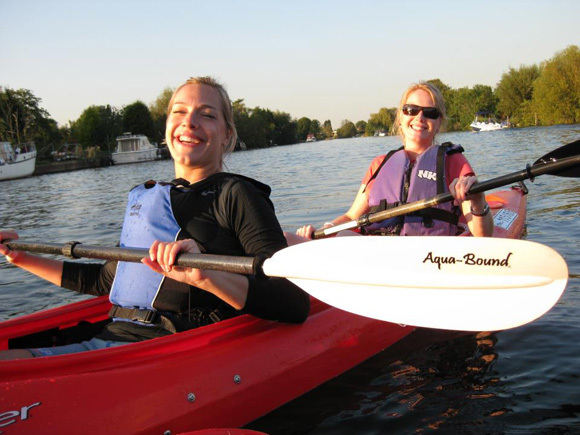 Kayaking London are based by the Thames in Chelsea and provide kayak trips which take in the Houses of Parliament, HMS Belfast and Tower Bridge.They also run corporate kayaking events and provide beginner’s courses and one-to-one training. Check out their website at Kayaking London. Moo Canoes are also based on the Thames, with a headquarters in London’s historic Limehouse basin, located in the East End. Moo Canoes run guided canoe trips to Tower Bridge and downstream to Greenwich, an area steeped in maritime history. Moo Canoes also provide canoe and kayak hire for use on the nearby canals, and can provide bespoke training courses. Visit their website at Moo Canoes. If you would prefer to do your own thing, why not hire a canoe from Thames Canoes Hire and explore the upper stretches of the River Thames? Thames Canoes will provide all the equipment you need and will meet you by the river. You can hire a canoe for a day, a weekend or an entire week. Once you have your canoe you are free to paddle along the river at your own pace, enjoying the beautiful scenery of the Thames valley. Canoe hire is also available at Lee Valley Canoe Cycle, just outside London in Broxbourne, and from Canoe and Kayak the Thames in Shepperton, west London. You don’t need a canoe to try a paddling trip in London. Active360 London Paddleboarding provide various SUP trips and taster sessions on the River Thames near Kew and on the Grand Union Canal. 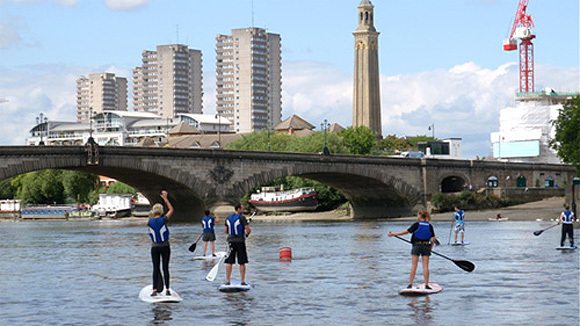 The Blue Chip SUPer Club specialise in providing SUP taster sessions on the Thames near Hampton Court and at Kingston Upon Thames.